For many genealogy researchers, we want to connect ourselves to a famous ancestor. It’s no secret. In all my research uncovering my military ancestors and those who have helped settle what would later become thriving cities, I, however, have yet to find a historically notable ancestor, or even connect myself lineally to a contemporary celebrity or dignitary; that is, until now. 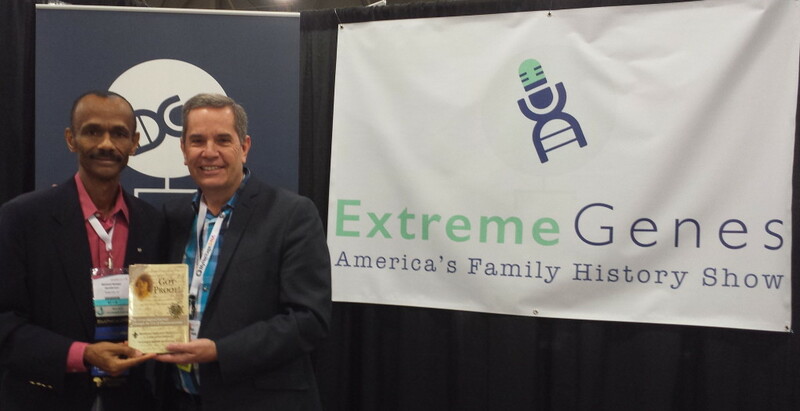 As a follow-up to my introduction to Scott Fisher — host of the Extreme Genes podcast — at RootsTech 2017 in Salt Lake City, Utah, I was invited to be a guest on his show. What a nice surprise! In that interview, I spoke about my ancestral research journey that led to my discovery of my fourth-generation great-grandparents — a Frenchman named Mathieu Devaux dit Platillo and an enslaved woman named Agnes. If you follow my Got Proof blog, you know that I published details of that journey in my memoir, Got Proof! During my interview with Scott, I also shared how my research of other family lines has uncovered six ancestors who served in militia groups under the command of Spanish Colonial Governor General Bernardo de Galvez, each of whom has now been recognized as a Louisiana patriot of the American Revolution. In addition, I’ve uncovered German-Swedish, African, Native American, and French Canadian ancestors, all tied to Louisiana and French Canada. I enjoyed sharing these and other genealogical discoveries with Scott as a guest on his podcast. Well, a few days after the podcast episode aired, I received an email from a gentlemen in France who had heard the podcast. He asked if I would be interested in learning a bit more research about my French and French Canadian ancestors I spoke about. Wow! Who doesn’t want that, right! I responded that I would appreciate anything he could share, and mostly figured I’d never hear from him again. Much to my surprise, less than forty-eight hours later, he emailed me a detailed pedigree chart showing my documented ancestral line to one of my known French ancestors, Pierre Etienne. I already knew of Pierre, as I’ve identified him as my ninth great-grandfather. The new information this listener brought to my attention, however, was an unlikely family connection to a current-day cousin that I was unaware of. On the pedigree chart that was sent to me, all of the dates and names link from Pierre Etienne to myself and to none other than Justin Trudeau, the current Prime Minister of Canada. What a shock! French Canadian cousins discovered after interview on Extreme Genes. Click image to enlarge. 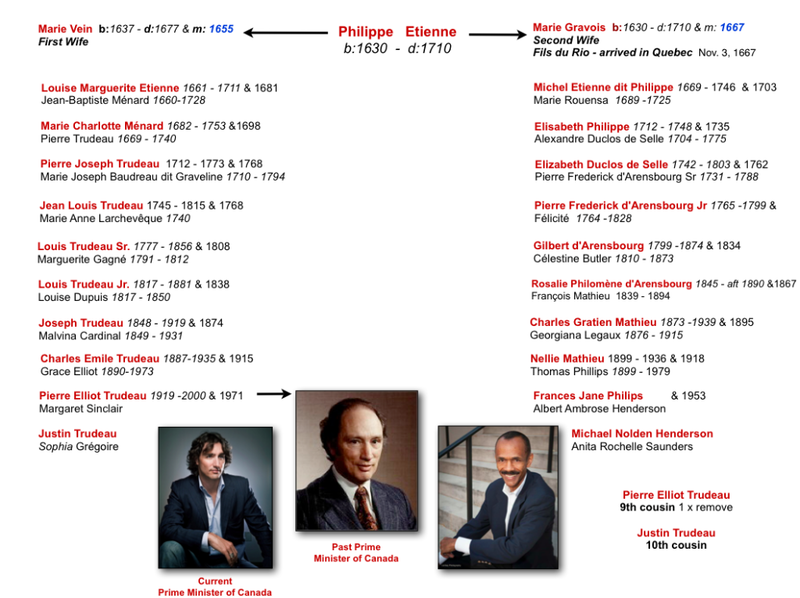 My new French research comrade had quickly built a pedigree chart showing Justin Trudeau as my tenth cousin, making his father, the former Canadian Prime Minister, Pierre Elliot Trudeau, my ninth cousin, one time removed. Unbelievable! Of course, I had to make sure my comrade had his research correct. So I compared his notes with mine, made a few slight corrections, added a few photos, and was able to confirm his results. When I emailed my thanks, he extended an invitation to me to attend, XXIVe Salon et Congrès National de Généalogie, a conference in France, which he believes would benefit me and my research. What a kind and thoughtful gesture; one that I will give some serious consideration to. You never know where help can come from. While I was focused on traveling back in time documenting my ancestors, someone who found my research interesting took it a step further and connected my lines to two modern-day cousins that I was totally unaware of. This is why I love doing interviews about genealogy and sharing my own genealogy research. 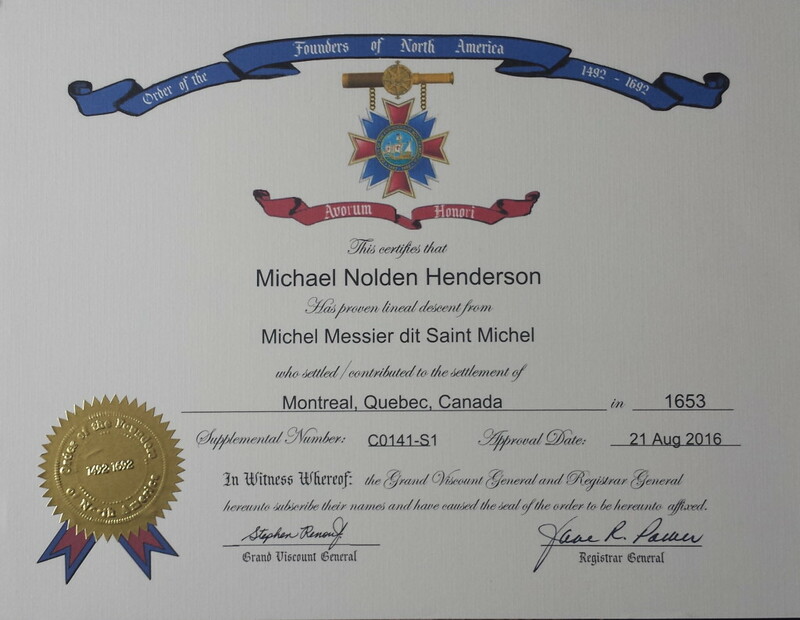 Once again, I have come to the end of yet another successful research journey with the completion of documented evidence and submission of an application to have one of my 17th century French ancestors named Michel Messier dit Saint Michel, an early settler in Montreal, Quebec, Canada, recognized by the Order of the Founders of North America (OFNA) 1492 to 1692. The OFNA is a lineage society whose purpose is to memorialize the individuals who founded North America through Colonization; including the Caribbean and offshore North Atlantic Islands during the period of 1492 to 1692. Members may descend from Spanish, English, French, Dutch, Scottish, Swedish, German, Danish, and Italian royalty, explorers, settlers, and seamen transporting and supplying these colonists. To learn more click here OFNA. In a previous blog post titled Family’s Female French Progenitor Discovered, Documented and Claimed, I submitted an earlier application after discovering and documenting my lineal descent from one of our family’s earliest known female French ancestors named Anne LeMoyne. As always, it is my sincere hope that each of you on a similar journey continued to be inspired by the many success stories and achievements such as this one. Check this family connection out. See here Justin and Michael.